Excellent products and customer assistance. I needed help determining what items would fit my car, and changed my mind a few times. The customer service staff was really very helpful in all aspects. Thanks so much etrailer! These work great. Easy to install and the hold the kayak nicely. Very happy with eTrailer service! They are J hooks. They bolt to the rack and hold the kayak. They work as advertised. I use them for my one person kayak. You have to do quite a lift to get the kayak up onto them, so my heavier 2 person kayak I use a different version with a roller to get the kayak up onto the car. I've been using them about a year and they are holding up well. J racks were delivered promptly and they were easy to put together with everything I needed included. The kayaks sit in them nicely and I think they will work out well. Very impressed with the prompt service and quality of the product. I recently purchased a Rhino-rack with Aero Crossbars and Kayak carrier. Customer Service was excellent. They suggested the Rhino-rack which was on sales and then suggested cheaper attachments for the kayak. My name on the order was misspelled and I never received a order confirmation but one call to Customer Svc fixed the order. I have not used the rack yet but I am impressed with the quality. Hauled up 2 Day touring Kayaks over 2000 miles without any issues. I purchased this for my son and friend, and told me it works great. It is easy to attach, fold down when not in use, and takes up very little space when storing. It made a great gift, as well as making loading and unloading simple and easy. Easy Setup and installation process. Solid construction. By far the best addition I have had to purchase for adapting my truck to compensate for my hobbies. 100% satisfied with the product. Fastest delivery I've received so far. Ordered and received within 5 days of purchase. 2 Thumbs up! Wish there were more companies out there like this. Carry my SUP on my Honda Civic with this on a Thule carrier bars. Has held up well after a year in the sun in Southern California. Its still holding up well after a year with exposure to the socal sun. I love this rack! I don't think I'll ever take it off my car. Cool and functional. I've used it for my snowboard in the winter and my surfboard and camping gear in the summer. Still love my Rhino Rack! The product came well packaged. Delivered in 5 days which is great service. Haven't installed the racks yet, but instructions are large and very clear. Also videos are great. Good simple secure. 2nd set because like the 1st ones performance. I got these to replace the Yakima Mako saddles. These are very similar saddles with the same strapping system as the Mako but these are so much easier to mount, adjust, and remove. The single sliding mechanism is a breeze to use and fits several size bars. I use these to transport Surfski Kayaks and they conform well to the haul and keep the kayak in place without needing to tighten the straps too hard and chance cracking the haul. Product was received as advertised and on time. Great service. Product shipped and arrived very quickly and everything claimed online was true about this carrier. Good product. Always am a little nervous that they will slip on the rack but they never have. (This is b/c we mixed Yakima on this one with different manufacturer for the rack and Yakima is built to be multipurpose so not perfect fit.) That said, nothing but success so far. I haven't used them yet, but they were very easy to install. These are still securely on my racks and cushioning my surf boards well. However, they did faded significantly from the sun which is a bummer. I had been parking in a garage. Moved, and had to park outside for 4-6 months until another garage became available. In those winter months where the sun was less strong, the pads faded. All that said, the sun is strong in Southern California. Super fast delivery, solid product.....thank you! Product is performing well. Has been left on my truck most of the time. Does not show any sun damage. I Luv it. I used to think twice about going with my kayaks because of the pain of putting 2 kayaks on my jeep roof. I have a very heavy tandom kayak. Now with hullavator, its easy. And it holds them really secure on The Jeep. Well worth the investment. I installed the Hullavater on my 2002 Toyota Tacoma's canopy that has 2" tubular rails. I couldn't find any cross bars to fit so I custom made the cross bar from scrap square tubes. It also lowers the high by about 4" compared to stock cross bars. Assembly is simple. I went online to download the English version instruction instead of the one in the box. Installing the loaders on the base bars is just a simple one pivot pin each. It depends on your vehicle's high, I have to climb a little to line up the holes to pin them. Maybe after frequent use, I will perfect my method. I first installed the cross bars too close together. When I strapped the kayak down, it put tension on one of the carriers made it difficult to snap lock in place. Realigned the cross bars, now it works as design. One down side is they sit very tall on top of my truck so I have to install them outside and remember to remove them before I back into my garage. I wish they can be folded down. I would give them a five stars. I read some complains about the bases get rusted easy. I sprayed them with rubber paint before I installed them. So far they look ok under Seattle sky. Although they are a little pricey, I really like that I don't have to climb up to strap my kayak not to mention it is easy on my back when load and unloading. The Thule Hull-A-Port is a great quality j-style kayak carrier. I feel like my kayak sits very secure in the arms of this carrier. The carrier mounted easily around the Thule AreoBlade Crossbars on my 2015 Jeep Patriot. The padding on the back of the carrier slides up and down for you to position the padding at the best spot for your kayak. I was also happy to find that I could fully open my hatch with my 9-1/2 foot kayak in the carrier. I did find that the bow and stern straps wanted to make contact with my vehicle. I decided to put the Thule Quick Loops under the hood closer to my windshield instead of at the front of my vehicle. I also put a protective piece of cloth (I used a canvas bag) at the Quick Loop at the back of my vehicle to protect my hatch from the stern tie-down. I think the Thule Hulaport kayak racks are the best, most secure way to transport your kayaks. I had these on my Xterra and hauled two kayaks up to Cape Bretton park in Nova Scotia, Canada from Connecticut, USA no problem. We were even able to store gear in the kayaks for the trip. I’m so excited to have them for my Crosstrek. Highly recommend these! Needed surfboard and SUP pads that fit trakrac 4” crossbars on my pickup. These fit perfectly. Thanks to the team at etrailer for the expert advice. I absolutely LOVE my Yakima Streamline Rack and SUP Pup!! Thanks to ETRAILER I was able to put together the perfect kit for my 2009 Porsche 911. It was a breeze to assemble. It looks so cool! All the products which I purchased at etrailer are high quality. 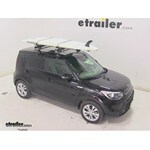 IMO, Thule makes the best equipment carriers on the market and etrailer sells them at the best price. Fast delivery, quality service. I received the rack and canoe package yesterday. I looked at the simple directions, and had in on my Ford Explorer in about an hour. It is well made, and i am very pleased with everything. Thank you for having such a wonderful product. I use it at least once per month. Mounting and de-mounting is super fast and you don't need any tools. I am still afraid that our kayaks will fly away one day so I used three fixing ropes for each kayak and they perfectly fits to the carriers. They don't move at all even if driving over 80 MPH. I would definitely recommend it. Perfect, and very Secure! I live in the Florida Keys and use these J Racks to transport a 12 Kayak, on my Toyota Corolla, over the many windy bridges, as we travel to our favorite launch site. Also the customer service from etrailer is Top Notch! Keep up the Great Work, you have earned a customer for life! Today on our 2014 Kia Soul. We're going to be test fitting the Thule SUP Taxi. A stand up paddle board carrier with a two board capacity, part number TH810. With our Thule Rapid Reverse Roof rack system already installed on our Soul. We're going to begin our test fit by grabbing the front half of our carrier, and placing it on to our front load bar. We would want the gray levers pointing towards the passenger side, we'll then bring our black rubber coated metal straps around the under side of our load bar and fit it back into the foot of the carrier. We'll then turn the gray from dial, to secure it on to our rack. I pulled one of the Rhino-Rack J-Style Kayak Carrier, part # S510 from our warehouse and took a measurement for you. I have attached a photo that shows the measurement of the knob and the bottom plate that goes under the crossbars on your 2014 Kia Soul. As noted on the photo, the combined measurement is 1-3/8 inches. If you have more than 1-3/8 inches from the bottom of your crossbar to the roof then these will work well for you. I checked with Yakima and the JayLow kayak carrier part # Y04073 that you referenced is a confirmed fit for the factory crossbars of your 2014 Kia Soul. This would be a great option for carrying 2 kayaks. You would need one carrier per kayak.